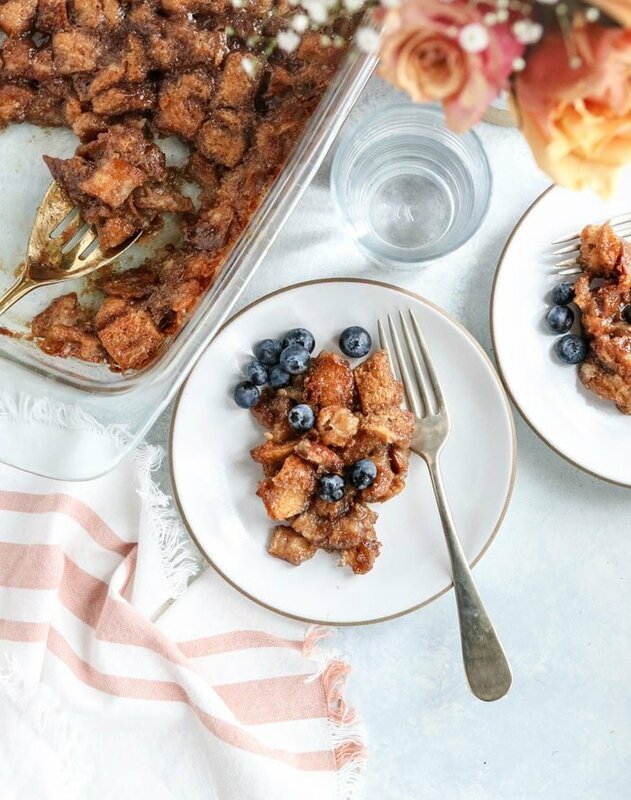 This Vegan Bread Pudding is a delicious addition to any holiday brunch, made without using eggs or dairy. 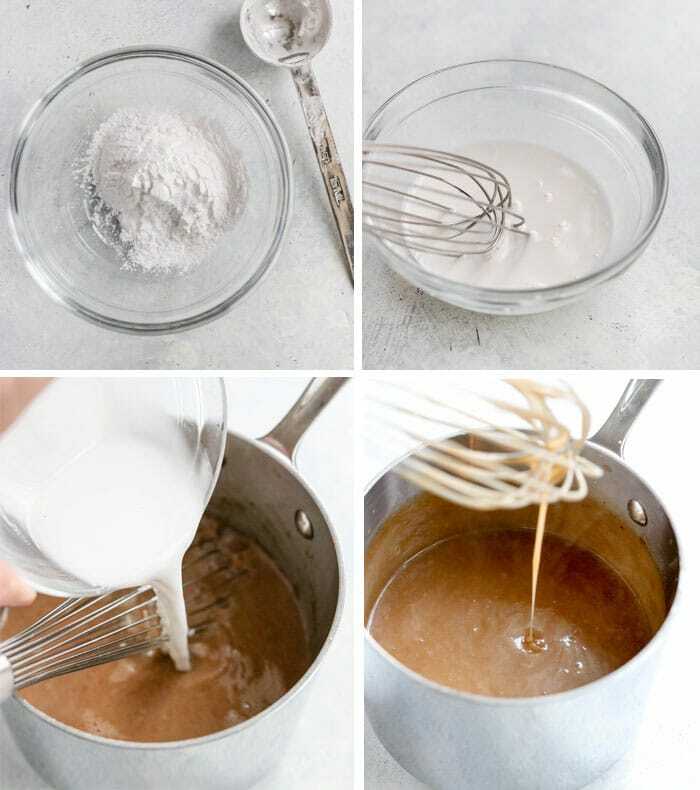 It’s super-quick and easy to make, calling for just a handful of ingredients to make a caramel-like sauce that will coat your favorite bread, and then it’s baked together for a decadent treat. Because this vegan bread pudding is egg-free, it doesn’t have the same structure as a traditional bread pudding that fluffs-up when baked. Instead, it reminds me of a cross between a baked french toast casserole and the “monkey bread” I grew up eating. Which is a delicious combination! 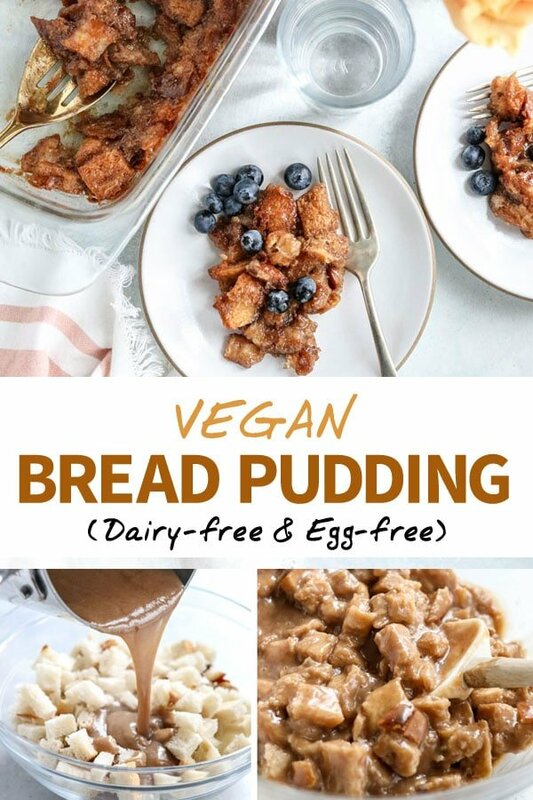 Traditional bread pudding is made with eggs and cream, so to replicate that bread pudding sauce I tried two different vegan egg substitutes. First, I tried using chia eggs, which was fine… but it tasted like a really “healthy” bread pudding. The second version I tried was MUCH better, using arrowroot starch to thicken up the vegan bread pudding sauce. Paired with coconut milk and maple syrup, it becomes a rich, caramel-like sauce that’s perfect for coating the bread cubes. 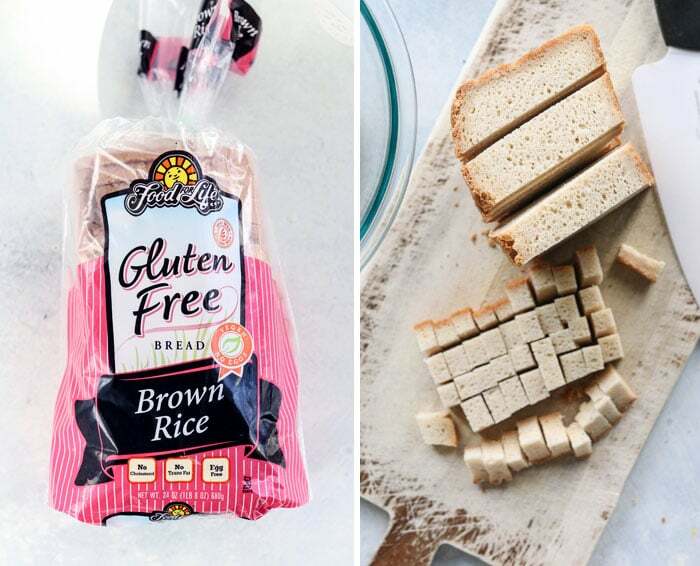 What is the Best Gluten-free & Vegan Bread? I also love Food For Life’s Brown Rice Bread, as another gluten-free and vegan bread, but it’s much denser in texture. As a result, it doesn’t absorb the bread pudding sauce as quickly, so I recommend letting the bread soak overnight as mentioned in the directions below. If you don’t have special dietary needs, and you just came across this recipe because you ran out of eggs, you can use any other bread you like. It’s particularly delicious when you use Brioche bread– but that is made with gluten and eggs, so it won’t be vegan in that case. Many gluten-containing breads are naturally vegan, so just be sure to check labels when you shop. 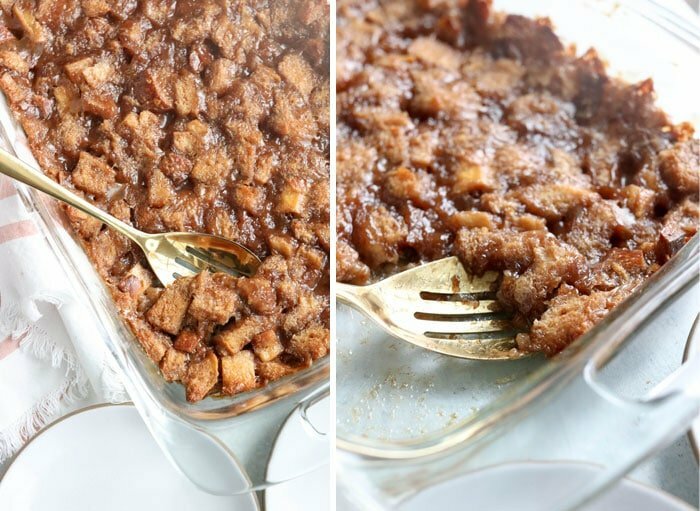 This VEGAN BREAD PUDDING is coated in a caramel-like sauce, made without eggs or dairy. It's perfect for a holiday brunch, sweetened with maple syrup! 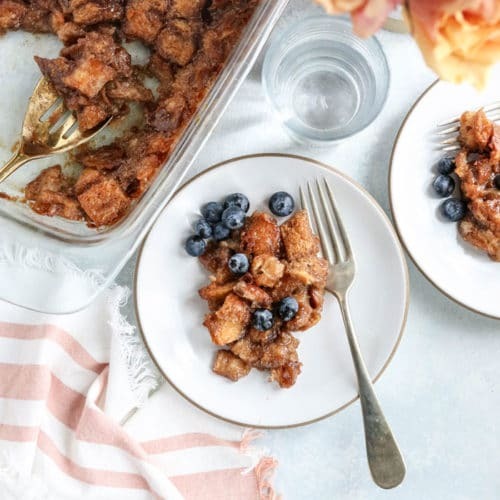 To prepare the vegan bread pudding sauce, combine the coconut milk, maple syrup, cinnamon, vanilla, and salt in a saucepan and bring it to a boil over medium-high heat on the stove. Whisk often until the mixture is boiling. While the sauce is warming up, add the arrowroot starch to a small bowl and stir it together with 2 tablespoons of cool water. Stir until the starch is dissolved and the mixture looks milky. Once the sauce on the stove is boiling, add in the arrowroot starch mixture and whisk constantly as the sauce boils. It should thicken up quickly once it's boiling, like a pourable caramel sauce. Remove the sauce from the heat. For a make ahead casserole, cover the bowl and let the bread soak in the sauce overnight. In the morning, you can pour it into a greased 9" x 13" casserole dish and bake. Or, you can bake it right away without the overnight soak. 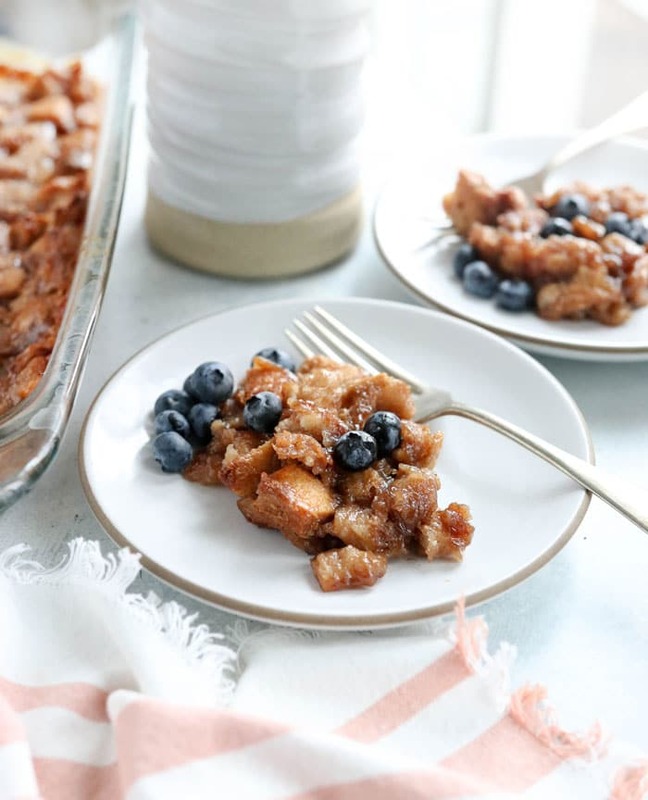 Allow the bread pudding to cool for at least 15 minutes before serving, then serve warm with fresh fruit on top. Leftovers can keep in an airtight container in the fridge for up to 5 days. I love the creaminess from the coconut milk in this recipe (and I don’t notice a coconut flavor from it), but you could probably use any other non-dairy milk you like in this case. You can use slightly less maple syrup if you’d prefer, but be sure to also reduce the salt in that case. As always, if you modify this recipe please leave a comment below letting us know what worked for you. We can all benefit from your experience! 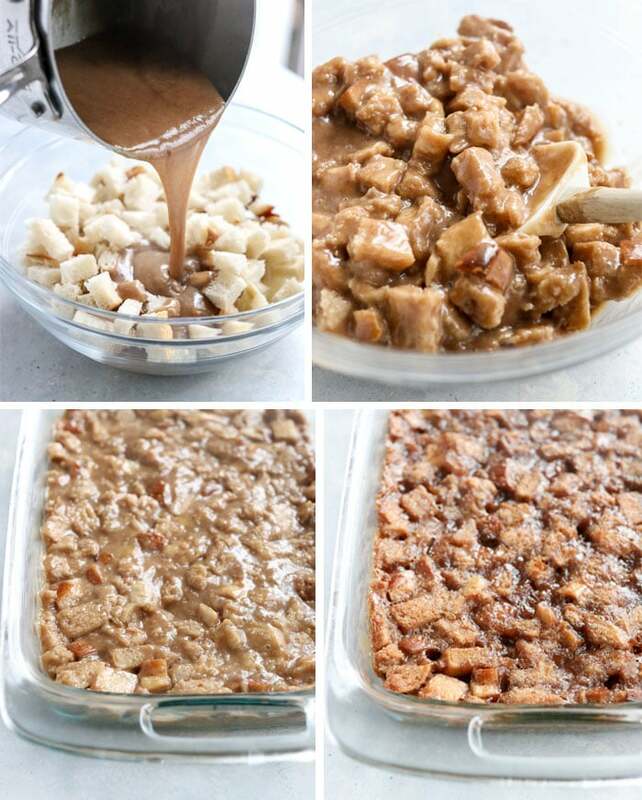 Reader Feedback: Do you make bread pudding for holiday gatherings? What’s your favorite sweet option to bring to a brunch? I can’t seem to find arrowroot starch? Tapioca starch or corn starch would work similarly for this recipe. This vegan caramel sauce is GENIUS. The ratio of salt and maple syrup is perfect– it’s like a salted caramel sauce without all the butter! I used it over the gluten-free bread from Costco and it was great. Thanks for all your hard work. Holy cow this is good! Made it as a test run this week for a possible Easter recipe, and it’s definitely a winner! Especially since it only took me 10 minutes to prep! Thank you so much for this! I used to like bread pudding until I, strangely, developed a severe sensitivity and aversion to the taste of eggs. This recipe sounds like a dream come true. Will tapioca starch be able to replace arrowroot starch by any chance? I would really love to try this but it’s difficult to find arrowroot starch in China. Yes, I think tapioca starch would work the same! Apart from your recipes, there’s something else I do love about your post and that has been for years now since I’ve been following you. And it has to do with the quality of the pictures of the recipes on your posts. Most times it’s always like I should start eating them from the post. They are really nice, sometimes I do think if the aroma will also come with it. Do you think this would work using dates blended with the milk, instead of maple syrup? Would you add a lot of extra milk? Probably! I would try it with a cup of dates and an extra cup of water for blending it up– you might even need an extra 1/2 to 1 cup of liquid after that to make it runny. Come back and let us know if you try it!